With decades on screen, both big and small, in front of a camera or speaking through the mouths of cartoons, Bill Murray has entertained the world for generations with wild antics that are larger than life. It’s no accident that a world that can barely contain him would find a fitting way to recreate him in a book as colorful as his personality. A team of talented artists looked through the long filmography of the man himself and provided a wealth of illustrations of Bill Murray, ranging in style from still life portraits to abstract recreations of iconic scenes and characters from the many movies and shows he’s starred in over the years. 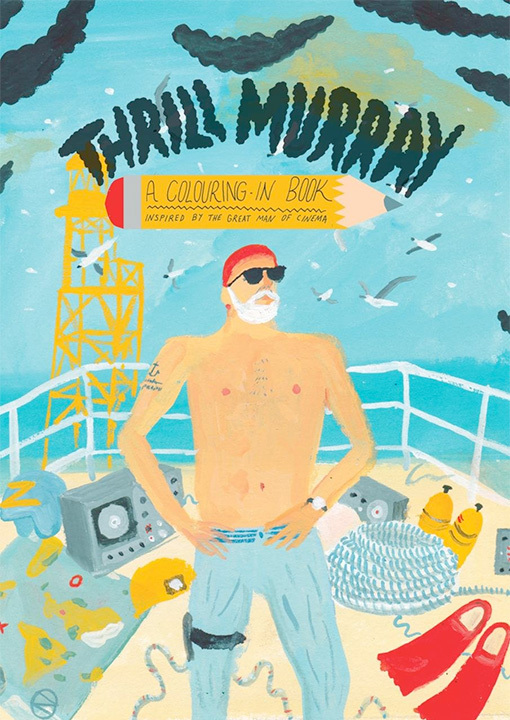 Thumbing through Thrill Murray leaves one feeling as though they are looking through a catalog of some of the greatest comedies from more than the last 30 years from one of the funniest men in the world of show business. As a man who lives life outside the lines, the artist holding this book is expected to color as their heart desires, which can lead to water color recreations of iconic moments from blockbuster comedy franchises like Ghostbusters or surrealist interpretations of imaginative Wes Anderson characters like those in The Life Aquatic with Steve Zissou. Regardless of age, everyone loves Bill Murray, and with so many illustrations and the freedom to interpret them, anyone can make their favorite funny actor look the way they’ve always thought of him and that will definitely lead to a good time. Thrill Murray is available at Amazon, or wherever fine coloring books are sold.